Cover Rating: 9/10 !! SO PRETTY. But that model.. erm.. does not look like Jackaby. This world is full of dragon-slayers. What we need are a few more people who aren't too proud to listen to a few fish. Jackaby was a really interesting, quirky read. To me though, it felt a bit unoriginal because it felt like it was trying too hard to be a cross between Sherlock (BBC) and Doctor Who. Mind you, I've never seen Doctor Who (don't kill me), but the similarities to Sherlock were really obvious. 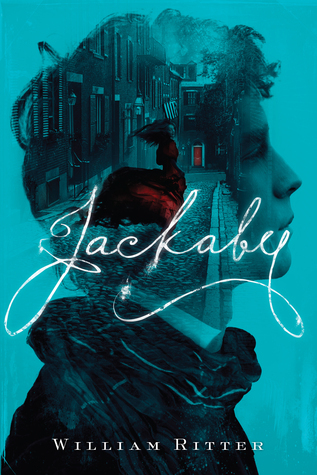 First I had this feeling that Jackaby was a mix of Sherlock and the Mad Hatter (Johnny Depp's version) because I don't know Doctor Who's personality and I didn't read the blurb... it was kind of a weird, fitting mix actually xD But anyways. Getting past that issue, it put a nice twist on a classic detective plotline! I loved the paranormal aspect. And it was well descripted as well. You could really easily imagine being along with Abigail in her 'big adventure'. The place this took place was a bit confusing though... because it said in the beginning that it was set in America, but the language and scenery were clearly London :/ Meh. I loved Jackaby! He was awesome. Like said before, personally it was like a cross between Johnny Depp's Hatter and BBC's Sherlock. What I would pay to see them both having tea. Abigail, our protagonist, was really cool too because she was independent. She wanted adventure, and she got one! With Jackaby of all people. I want! There isn't really much to say about them though because they felt too similar to the TV shows. In books, I like it when authors put themselves inside the characters, (see my review of Every Ugly Word. That's a really well done book.) but they don't seem emotionally real enough if they're mostly based on someone else's work. Overall it was quite nice, but the character issue put me off a bit. There was nothing that made my jaw drop and go WOW, BUT it was still a funny, quirky and just a quick mystery read that I enjoyed loads! —Miss Oddball€ Over and Out.